As leaders in providing high quality, innovative medical care, District Medical Group maintains this consistency of care by taking the leading role in training the future healthcare providers of Arizona. Training tomorrow’s doctors to ease Arizona’s physician shortage, we have produced more practicing doctors than anyone else in our state. Board pass rates for our residents are 95% in our medical programs, a hallmark attributable to the thoroughness and excellence of our teaching faculty. In addition, we train and mentor allied health professionals, including nurse practitioners, physician assistants and pharmacists. Our “Physicians of the Future” scholarship program provides financial assistance not only to deserving medical students but high school students who plan to pursue medical careers. 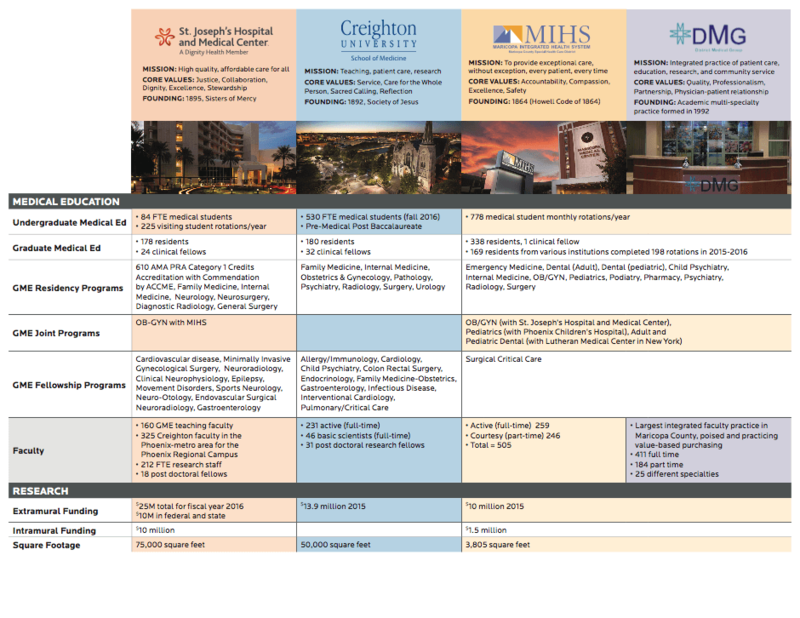 DMG’s clinical departments, in conjunction with MIHS, offer physicians and allied health personnel accredited regularly scheduled Category 1 Continuing Medical Education credits with Grand Rounds, as well as special events, lectures, workshops, classes and community academic events. Maricopa Integrated Health System (MIHS), Creighton University School of Medicine, Dignity Health St. Joseph’s Hospital and Medical Center, and District Medical Group, Inc., have announced a new alliance. The partnership is aimed at increasing the number of doctors and other health professionals in Arizona in order to meet the state’s growing demand for physicians and other healthcare professionals.